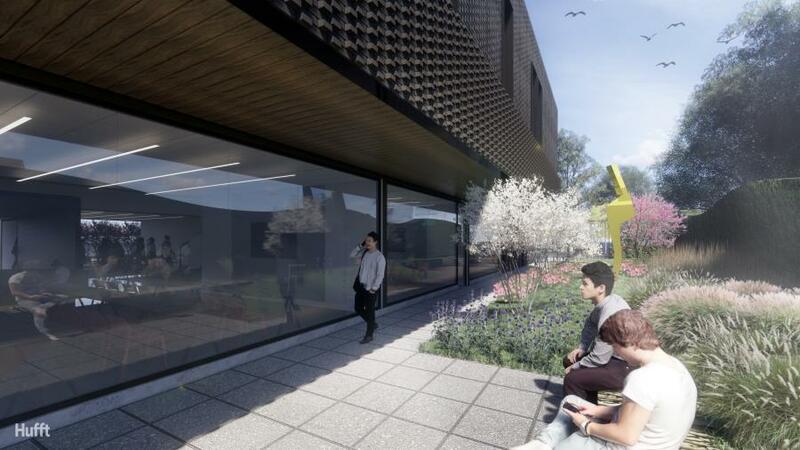 The Kansas City Art Institute (KCAI) will break ground April 26 on a new, 18,000-sq.-ft. building that will house the liberal arts program including art history and creative writing, as well as all student services. The opportunity to build the Hall, located on the northeast corner of 44th and Oak, is largely due to the generosity of donors who have given to the Space to Create capital campaign. The Hall is designed by Hufft, a Kansas City-based architecture, interior design and custom fabrication firm. Award-winning landscape architects Hoerr Schaudt will design the expansive outdoor spaces, and Kansas City construction company McCownGordon will build the facility. According to Tony Jones, the Nerman Family president of KCAI, the college worked closely with the surrounding neighborhood associations and the tone of the Hall is less institutional and more residential. "We wanted it to be very beautiful and appropriate for the neighborhood," Jones said. "From the very beginning we have pictured this as classrooms in a garden, a building that is a pleasure to work in and walk past," said Jones. This new Hall will redefine the KCAI student experience. Since all majors are required to take art history and liberal arts courses, every student will benefit from the spacious, light-filled classrooms with state-of-the-art technology for learning and a courtyard garden for socializing. Additionally, it will be the first time all student services, including academic advising and financial aid, will have offices in the same building to streamline student operations and support. A unique architectural feature of the Hall will be the entry portal on Oak Street. Visitors will enter through a portal adorned with panels, each engraved with the name of influential art historians of the past and present. The entrance will become a tribute to the individuals who have interpreted and written about art and artists for future generations. "Many museums and art centers celebrate artists by having their names on the façade — but no one has honored art historians — the scholars who interpret, explain and tell us the stories of those artists. I think they deserve thanks and recognition," said Jones. "It is a true honor to be working with the entire KCAI team on this project," said Matthew Hufft, founding principal of Hufft. "With four KCAI alumni currently on our Hufft team, we see firsthand the exceptional education KCAI provides its students. We believe this building will add to the student experience, as well as contribute to the already amazing aesthetic of the surrounding neighborhood." The Hall also will be the home to KCAI's new minor in entrepreneurial studies in art and design, which will prepare artists and designers to have an entrepreneurial spirit, business acumen and the leadership skills to engage in innovative artistic ventures. A partnership with The Regnier Institute for Entrepreneurship and Innovation, a program of the Henry W. Bloch School of Management at the University of Missouri-Kansas City, provides KCAI students with access to entrepreneurial courses taught by experts in the field. Construction on the new Hall is scheduled to begin in late spring.